The Jack Kent Cooke Foundation has its first ever mother-daughter scholar pair! 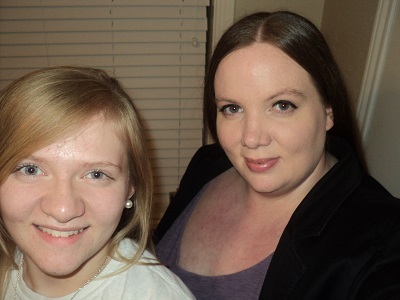 Angela Allison is a 2011 Undergraduate Transfer Scholar and current Graduate Scholar, and her daughter, Summer Mensch, is a new Young Scholar. A 2013 graduate of Texas A&M, Angela is currently pursuing a Ph.D. in political science studying public policy, race, and ethnic politics there. Summer attends the Inquire Academy at Jane Long Middle School in Texas and will enter high school next year. Angela and Summer were kind enough to sit down and answer a few questions about their unique bond as scholars, the application processes for each of their scholarship programs, and more. Check out our exclusive Q&A below. Angela, how did you first hear about the Cooke Foundation and its Undergraduate Transfer Scholarship? I initially heard about the foundation and the Undergraduate Transfer Scholarship from Joseph Denman and Randall Allison, my Phi Theta Kappa Honor Society advisors at Blinn College. At the time, I was hoping to transfer to a four-year school during the following year, so their announcement piqued by curiosity about the foundation. I had a 4.0 GPA, was core complete for my bachelor’s, had a plan to obtain a four-year degree in political science, and had been accepted to several universities. Everything was in place for me to transition to a four-year school except the financial piece of the puzzle. After hearing what my PTK advisors had to say about the foundation and the kind of student who would make a competitive applicant, I realized I might have a shot at this scholarship, so I decided to apply. Did the thought ever cross your mind that your child may apply for a scholarship from the same organization? The day I learned of my award was a day that also marked a monumental change in Summer’s life, too. She was really amazed that I was going to be a part of the Cooke Foundation and benefit from their mission and generosity. She wanted to know how she could get involved with the foundation, and I told her about the Young Scholars Program. That day, she decided she was going to become a Young Scholar. Everything we’ve done since then has been in a concerted effort to position her to attain this goal. Over the past three years, we have adopted several motivational “Cookie Mantras” to help Summer remain conscious that she was working toward her goal of becoming a Young Scholar. “Have you prepared enough to make a Cookie-worthy grade on that test/project/paper?” was something I asked Summer on a daily basis. If the answer was no, we would spend more time preparing until she could answer yes. Tell me about Summer’s application process. Before the application opened, over the holiday break, we engaged in prep work by brainstorming about kinds of things she wanted to tell the selection committee about who she is and who she aspires to be. I’ve heard others call the application process intense, but it was really fun for Summer (and for me). It involved a ton of writing to narrative prompts, but Summer is a strong writer and had many interesting stories to share with the selection board about her life experience and how they’ve shaped her goals. Once Summer made it past the first and second selection phase, she was invited to participate in an interview session with a Cooke Foundation Young Scholars Program adviser. She was nervous about this part of the process because she’s more comfortable writing for people than speaking to them. But, my grad school adviser, Ken Meier, worked with her to develop confidence in her verbal communication skills, which Summer used to successfully complete her interview and ultimately move on through to the end of the selection process. Summer, since you are brand new to the Young Scholars Program, tell me what you are most looking forward to. Are you excited to work with your adviser? I’m looking forward to a couple of things. The Young Scholars Program will be giving me funding for enrichment activities. Right now, I’m thinking about attending a cultural and language immersion program to learn Spanish this summer. I’m especially looking forward to the chance to travel internationally to learn about other cultures and hope to participate in a foreign exchange program in high school. I’m also excited to develop a relationship with my educational adviser, Mojeje. She majored in cultural anthropology in college, which is also what I want to study. I know she will be an excellent resource who can help me with academic planning and finding opportunities to help me explore my interest in cultures. It must be pretty neat to share such a big accomplishment with your mother. What and how did she teach you about hard work and success growing up? My mom taught me that you have to set high expectations for yourself. No one else is going to do that for you. Even if they did, do you really want to spend your life trying to become who someone else thinks you should be? Also, she taught me to not let adversity define who you can or can’t become. You shouldn’t use disadvantages as an excuse not to think big and work hard to achieve your goals. Having to overcome challenges might make achieving your goals more difficult, but giving up makes fulfilling your dreams impossible. What were your first thoughts when you heard the good news? I was surprised when my school principal, Lindsay Harris, announced at our school meeting that a Jane Long student had won a prestigious, national award. I was shocked when she announced that student was me and the award was for the Jack Kent Cooke Foundation Young Scholars Program! My first thoughts were, “Wow, now I am going to get to do all those things I talked about wanting to do in my application, like traveling to learn about other cultures and going to an elite university!” It is really amazing to think of how many of my goals I will get to pursue and how much I will grow with the support of the Young Scholars Program. Finally, what are your plans for the future—Angela, life after becoming a Ph.D., and Summer, any ideas about high school or college? We have pretty similar long-range plans that involve doing work that focuses on understanding how society and its political institutions affect the lives of people from disadvantaged groups. Angela: Once I’ve completed my Ph.D., I plan to continue my research about reproductive health policy and how these policies affect the lives of women who are members of politically underrepresented groups, like racial minorities and low-income families. Continuing this research is important to me because I know that access to reproductive healthcare is a critical factor in determining whether a disadvantaged woman retains her status as a welfare mom or achieves the bodily autonomy necessary to pursue economic self-sufficiency. My hope is to generate research that can improve reproductive health outcomes for these women, as well as the lives of their families. Summer: This summer the Cooke Foundation is funding my time at Concordia Village’s four-week Spanish Language and Cultural Immersion Program in Minnesota. In the fall I will participate in the International Baccalaureate Diploma Program at Travis B. Bryan High School, which will be a great fit for me because it has strong international culture and community service components. After high school, I would like to attend Cornell University or UC Berkeley and major in cultural anthropology. Eventually, I see myself doing work that looks at the lives of disadvantaged groups from around the world and how they interact with the rest of society. My career goal is inspired by people like Malala, who remind me that unequal treatment of certain groups of people still happens on a global scale. I want my work to help create attention about this problem and solutions to make their lives better.